Rabbit anti Bovine, Chicken, Human, Monkey, Mouse, Rat TUBB2A. A synthetic peptide corresponding to amino acids 417-435 (DLVSEYQQYQDATADEQGE) of human TUBB2A. 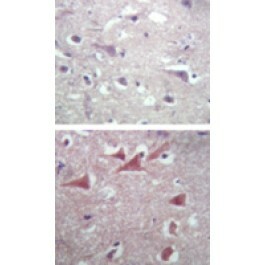 Rabbit polyclonal antibody raised against synthetic peptides of TUBB2A. With 0.05% sodium azide, 0.2% gelatin.